Imran Khan is the second Pathan to be elevated to the top job in Pakistan after Yahya Khan. His radical background is well established known. His links with Taliban and his funding of the Haqqani seminary known as the 'Oxford of Global Jihad' is well documented, which earned him the title of "Taliban Khan". Even Fazlur Rehman Khalil, who was put on US-designated global terrorist list along with both his terrorist organizations Harkat-ul-Mujahideen and Ansar-ul-Ummah is openly supporting Imran; Khalil is linked with Al Qaeda and his terrorists have been active in both Kashmir and Afghanistan. He was more than happy with the military permitting radicals and extremists, including those designated "terrorists", to contest in elections and campaign because they all supported him. Jaish-e-Mohammed (JeM) is currently building a 15-acre complex on outskirts Bahawalpur (Pakistan) to train thousands of young children for Jihad. JeM supported Imran, calling Nawaz Sharif traitor to Pakistan and Islam. Masood Azhar and JeM operate freely asking for donations publicly despite Pakistan placed on FATF 'grey' list and agreeing to 26-point action plan to check financing terrorist groups. Should Pakistan's financial woes worsen, Imran could be used to ensure terrorist groups hold their activities for whatever temporary period. Significantly, considerable number of his cabinet members had also served in the cabinet of Musharraf. Therefore, the line of thinking would not be much different. As chief of Pakistan Tehreek-i-Insaf (PTI), Imran's foreign policy advisors Shireen Mazari and Shah Mehmood Qureishi were staunchly anti-India. In fact, with Imran's support to JeM, one should expect more foreign terrorists inducted in J&K. 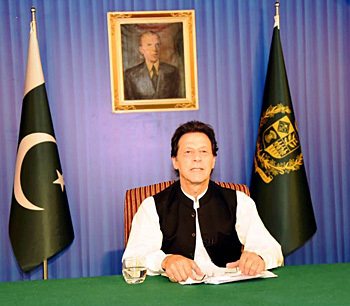 The military-ISI of course will continue to define and dictate Pakistan's foreign and defence policies, with Imran left to play around with economics and governance. Taliban firing rockets close to the Presidential Palace in Kabul as President Ashraf Ghani was delivering his holiday message for the Muslim celebrations of Eid al-Adha. Quite evidently, Pakistan is intent on heightening its proxy wars in Afghanistan and India. J&K is witnessing more killings of army and policemen on leave and now also a forest officer, aimed at dissuading them from joining government service. China supports Pakistan's terrorism and has been consistently blocking India efforts to have Masood Azhar, JeM chief designated 'terrorist' by the UN because of multiple terrorist acts in India, including the December 2001 attack on Parliament, and January 2016 attack on Pathankot airbase. With China's plans revealed of settling 5,00,000 Chinese in Gwadar by 2022, China's colonization of Pakistan is already underway. With the informal summit between Prime Minister Narendra Modi and Chinese President Xi Jinping, followed by Chinese Defence Minister four-day visit to India, China is signaling peace overtures primarily to mollycoddle India into joining the CPEC, but the basic China-Pakistan strategy to shrink India's strategic space within South Asia and grab as much Indian Territory as possible remains intact. According to Bruce Riedel, former CIA Director, Pakistan is set to become even more dangerous with Army-Imran at the helm. Imran, therefore, could well prove to be Musharraf 2.0, despite homilies of peace and improving relations. India will need caution and firmness in dealing with Imran Khan.